Mike Gregoire was born and reared in Everett, Washington. His mother taught elementary school in the Everett School District for 35 years. His father worked as a private contractor and union carpenter. A 1963 graduate of Everett High School, Mike remains connected to many of his high school friends — he and his football buddies regularly get together to practice the art of poker. Mike graduated from the University of Washington with a history degree in 1968. While student teaching at a Seattle high school the year before, he weighed following in his mother’s footsteps. During finals week that year, Mike received his draft notice. While his classmates celebrated their graduation day, Mike began basic training at Fort Lewis. After completing field artillery Officer Candidate School at Fort Sill, Oklahoma, Mike was commissioned as a second lieutenant in the air defense artillery corps. He then served a tour of duty as a platoon leader and convoy commander with the Delta Express in Vietnam’s Mekong Delta. Upon returning to Washington, Mike met Chris in September 1971, when they were both working for the Department of Social and Health Services. For their first date, Mike packed a picnic lunch and took Chris on a hike. After several hours of wandering, Chris realized they were lost, and wondered if Mike’s navigational skills had been left behind in the Delta. Three years later, however, Mike navigated Chris perfectly down the wedding aisle. He and Chris have two adult daughters: Courtney, an attorney, and Michelle, who is attending law school. In the meantime, Mike worked as a health care investigator for the state of Washington for 30 years. Retiring in July 2003 hasn’t slowed him down. He harvests bumper crops of tomatoes and vegetables and fits in an occasional golf game. As the state’s First Gentleman, Mike was an enthusiastic advocate for children’s and family literacy. As a parent, Mike recognized the importance of reading with children. He also knew that solid reading skills prepare young people for academic success and a lifelong love of learning. Mike traveled across the state to visit schools and libraries. He visited at least one elementary school in each of the state’s 39 counties, where he read to students and thanked teachers, principals and librarians for their good work. Mike’s service in the military spurred a lifelong commitment to veterans’ affairs, an issue that he cared about very deeply. He lobbied the Governor over dinner on veterans’ issues and was committed to making sure our state lives up to its commitments to our servicemen and servicewomen. Mike’s vigorous advocacy in a veterans’ coalition resulted in unprecedented legislation to establish the Washington State Veterans Cemetery in Medical Lake, the first on the east side of the state, and the Veteran Conservation Corps. He is a lifetime member of the Veterans of Foreign Wars and a member of the American Legion and the Vietnam Veterans of America. 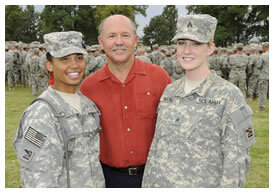 Over the Governor’s two terms, Mike attended deployment and welcoming ceremonies for service members and their families. And he attended funeral services for our fallen warriors. Mike was heartened to witness the development of memoranda of understanding between the Washington Department of Veterans Affairs and higher education institutions to better serve the needs of veterans who were pursuing a college education. Mike was happy to let veterans know about state services offered for post-traumatic stress disorder. In fact, Washington was the first in the nation to deliver these services in a coordinated, statewide manner starting almost three decades ago. And Mike was also pleased to support housing services for homeless vets. Veterans knew they had a strong and capable advocate in Mike Gregoire.